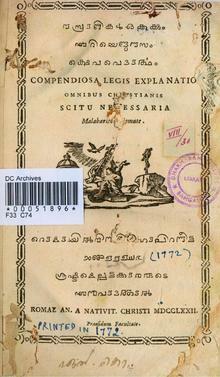 ^ "(C. Radhakrishnan) Grantha, Vattezhuthu, Kolezhuthu, Malayanma, Devanagiri, Brahmi and Tamil alphabets". C-radhakrishnan.info. Retrieved 20 February 2012. ^ a b c d "Ethnologue report for language code: mal". Ethnologue.com. Retrieved 20 February 2012. ^ "Census Of India - Data on Language". Censusindia.gov.in. Retrieved 30 March 2012. ^ "Wals.info". Wals.info. Retrieved 20 February 2012. ^ "Language". kerala.gov.in. Archived from the original on 11 October 2007. Retrieved 28 May 2007. ^ "Flos Sanctorum in Tamil and Malaylam in 1578". Tidsskrift.dk. Retrieved 20 February 2012. ^ "Kerala / Kozhikode News : Copy of first book printed in Kerala released". The Hindu. 14 October 2005. Retrieved 30 March 2012.